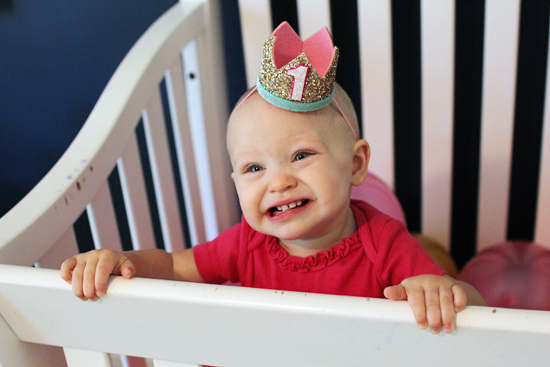 And in the blink of an eye, she's one! 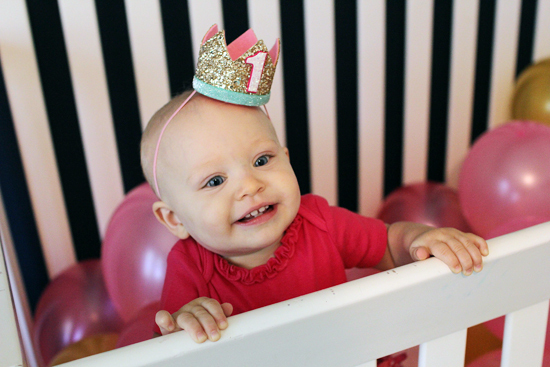 We celebrated Thea's first birthday July 28th, and I'm still in denial. I just can't believe it! Fastest year of my life yet. Thea is definitely growing in so many ways. We actually had two doctor appointments in the span of four days, her pre-op physical at Children's Mercy, and her one year well check with her primary. At the pre-op appointment they recorded her weight at 19 pounds 14 ounces, and measured her at 29 inches tall. 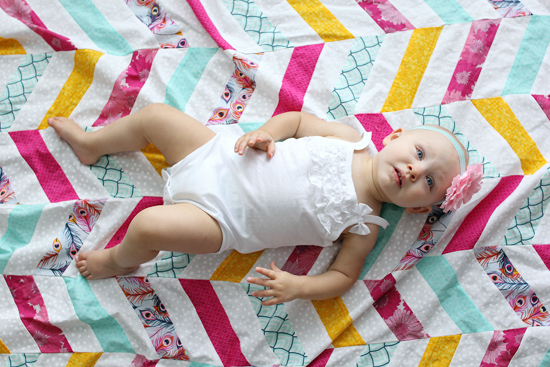 Three days later the pediatricians office said she was 20 pounds 10 ounces and 30 inches tall. I highly doubt she grew that much in three days, so I'm guessing someone had their measurements off, but I'm not sure who! She is wearing 6-12 month clothes, size three shoes, and still size three diapers, but just this past week I've started putting 4's on her overnight. As soon as we run out of 3's I won't buy anymore. And still six teeth, but her pedi said she thinks maybe one of her molars is coming in. Sleep still isn't my favorite subject in this house, but the baby isn't the only one to blame. A few weeks ago I was up three different times, and it was NEVER with Thea. For the most part she has started sleeping until 5:30 or 6am, and she takes two naps a day, totaling 4ish hours, so I can't complain too much. But I really thought once she was sleeping through the night I would be too. Wishful thinking, obviously. Miss Thea still doesn't seem ready to drop a nap, so we'll stick with two for a bit longer. She is also still more or less nursing to sleep. Oy. I'm hoping to be away from her overnight in October, so we're going to have to deal with that habit by then. Mama is ready for a break my love! Speaking of nursing, we are successfully dropping sessions. I nurse her three to four times a day. I don't think she'd really care if she was nursing less, she just likes the soothing aspect of it before going to sleep. So that is pretty much where we're at. I nurse her before naps and bed, and sometimes in the wee hours of the morning or first thing in the morning. Just depends on when she wakes up and whether Chris or I get her out of her crib in the morning. She is doing great drinking whole milk from a sippy cup, chugging four ounces the first time it was offered to her. Girlfriend LOVES to eat. Though she is a bit picky. Vegetables are evil, sweets are the bomb dot com. She no longer hates blueberries, and goes bananas for squeezy pouches and cheese. I think her food hierarchy would go sweets, cheese, squeezy pouches, fruit, carbs, meat. Vegetables wouldn't make the cut at all. And her love for cake is pretty much unmatched. 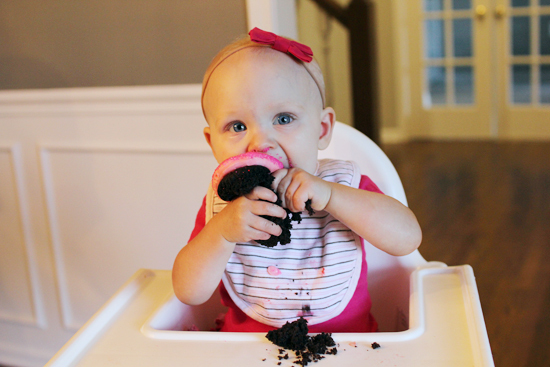 I knew she would like it, but Thea attacked her birthday cupcake with out a second thought, and cried when we took it away. 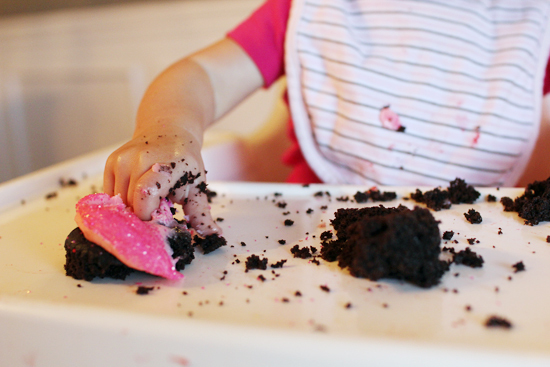 When we brought out her smash cake at her birthday party she more or less cried until it was on her tray. Then a few days later it was Daddy's birthday, and there were big fat alligator tears when we set a cake in front of him, not her. Sweet baby I apologize for your sweet tooth, I'm sure you get it from me! My guess turned out to be correct, Thea was walking by her birthday! 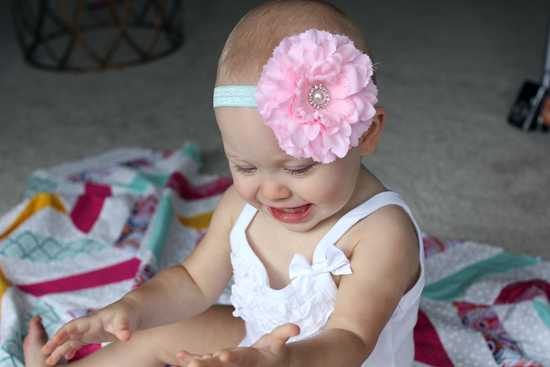 She took her first wobbly steps on July 5th. After that, there was about a week of just a few steps here and there, mostly when we made her go between Christopher and I. Then those few steps turned into a few more, and then she started practicing going from her anywhere chair, or 'launch pad' as I was calling it. 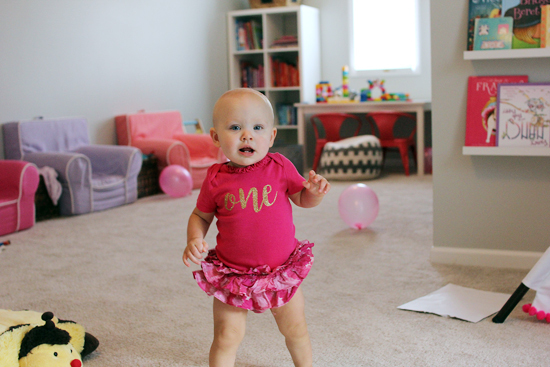 Two weeks after her first steps she started standing herself up in the middle of the room, and just two days later, a week shy of her first birthday, she became a full time walker. She is getting better everyday, but there is definitely a lot more grit than grace, and she definitely looks like a mini drunk most of the time. When she is getting tired she stumbles more, and then she just keeps trying to walk before she is stood all the way up so the falling becomes a vicious cycle. Still so fun (yet terrifying) to watch her cute little self walk around! While I still wouldn't say we have any clear words, Thea's communication skills are starting to explode. She can sign more, all done and please. She tells me the animal sounds for dog, cow, bunny (hop hop! ), elephant, gorilla (my favorite) and fish. She waves hi and bye, claps her hands, and throws her arms in the air when we say hooray. She has the most awesome 'yes' nod, and shakes her head 'no no no' when you tell her not to do something. Not that she listens, but hey. She tries to say uh-oh, but it usually just sounds like noises, or uh uh. She can point out some objects in a book, and is really starting to enjoy being read to. Her attention span is short, but she regularly brings me books and crawls into my lap so I can read. Her favorite right now is an Usborne book we got called "All Better". I'm pretty sure baby dolls are still her favoite toy. The night before her birthday we had her presents sitting out, when she randomly woke up at 9pm (after going to bed early at 7pm). She wouldn't go back to sleep so I brought her downstairs for a bit. She saw a little doll I picked up at Walmart and had to hold it. I refused to take it out of the box because dang it, it was a present for her actual birthday, so she just carried around the doll inside the box, rocking it, hugging it and patting it. She also really loves Fisher Price Little People, especially the princess castle. Swinging is her jam, as is riding in the little push bike we got when Ryann turned one. Thea really is just so damn cute. I can't help it, I'm kind of obsessed with her. It isn't as if I love her more than her sisters, or she is a more easy going baby than them (well maybe? I have no idea). I have just been able to enjoy her so much the last several months. 9 months to 18 months might possibly be my favorite. I can watch her dink around the playroom for a long time, she is absolutely adorable exploring and learning. Dangerous, yes, this girl seems relatively fearless. But so so so much fun to watch and be around. 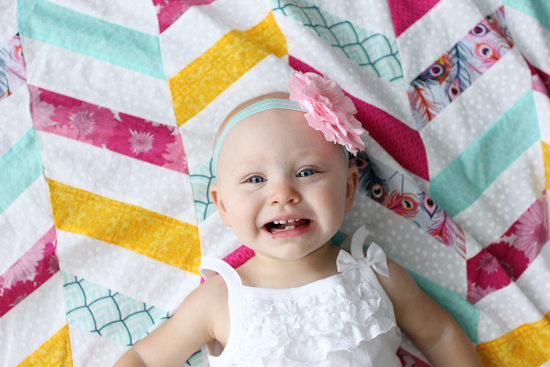 Sweet little Thea, I love you so much. Happy Birthday. Now stop growing so fast!